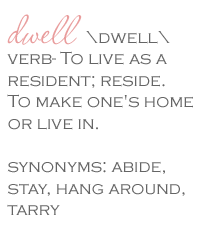 Dwell by Cheryl: "My Mirror Mate Makeover"
Well, I'm back from a relaxing stay-cation. It was fantastic to be at home for an entire week with time to do all the things that you want to do, but never have the time. I'm not much for laying around, even on vacation, so much of my time off was spent completing projects that I've been trying to get to for months. And that for you my friends, means lots of blog content. So let's kick the summer off with a reveal that's been weeks in the making. 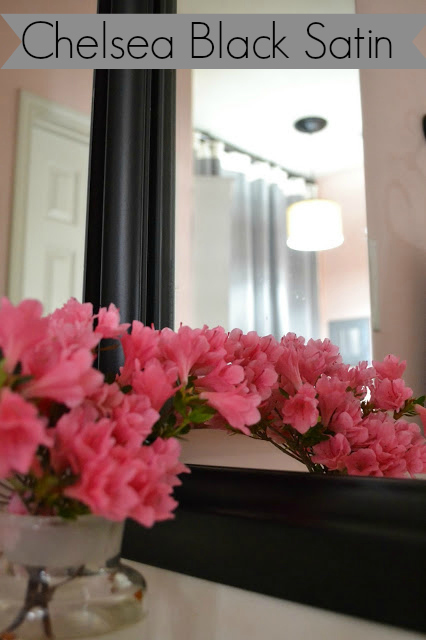 While attending the Design Blogger's Conference in LA a few months ago, I was able to connect with representatives from a great company that I've referenced on the blog before, Mirror Mate. Much to my surprise, they're actually local to the Charlotte Metro. Needless to say, when they reached out to the conference attendees asking how they could support our blogs, I was eager to respond. 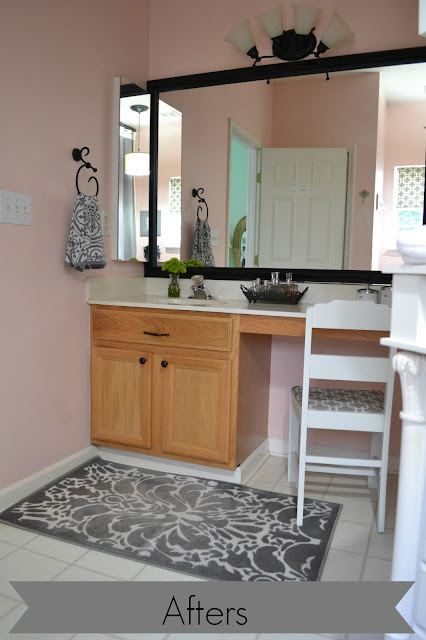 You likely recall my recent bathroom makeover (click here if not). We'll it really bugged me that the mirror was just there, and totally blah. So when Mirror Mate offered to let me do a blogger review, I jumped at the chance. Yes please! Mirror Mate custom cuts your frame and sends you a complete kit. It's really easy! 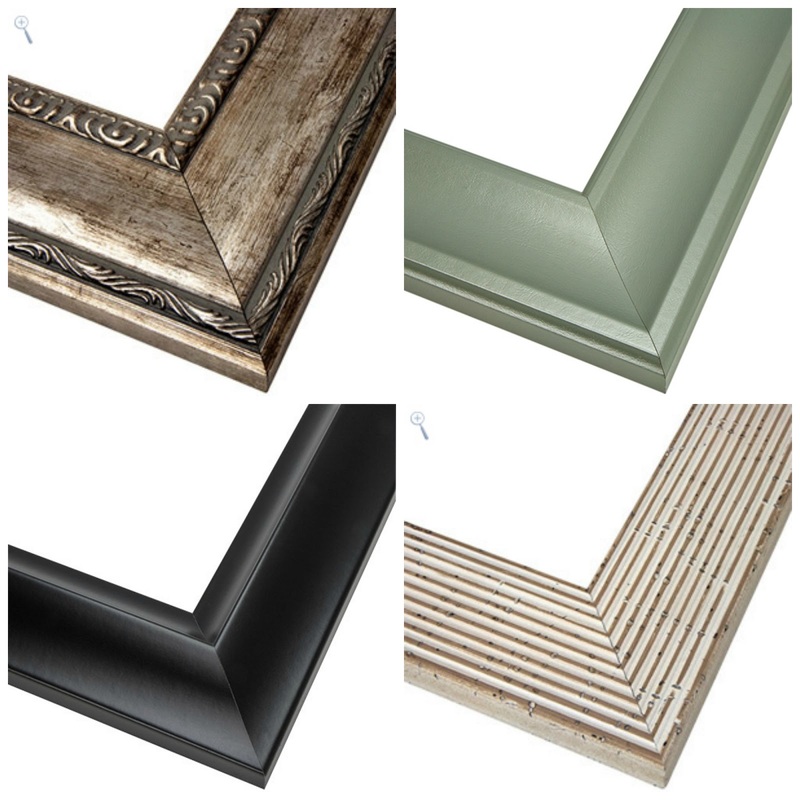 You simply assemble the four frame legs with connectors and press the pre-taped frame right onto the glass. The whole process takes about 20 minutes (if you follow the instructions) and the change is pretty dramatic. 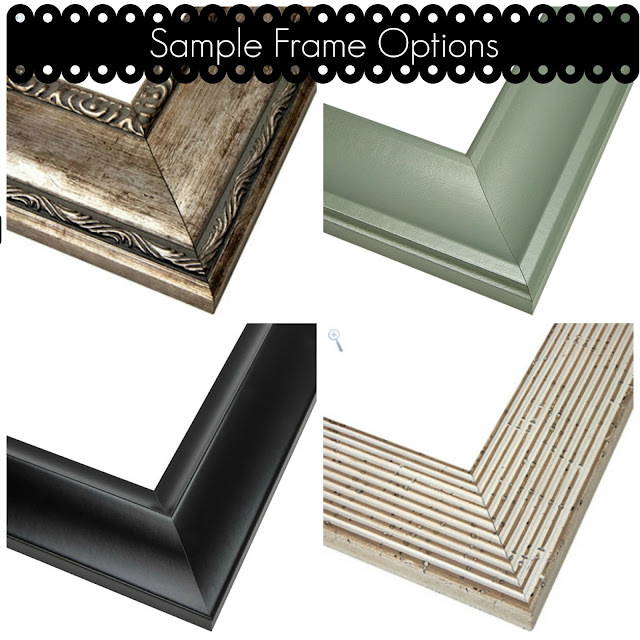 My favorite thing about the product is the variety of frames and price points available. 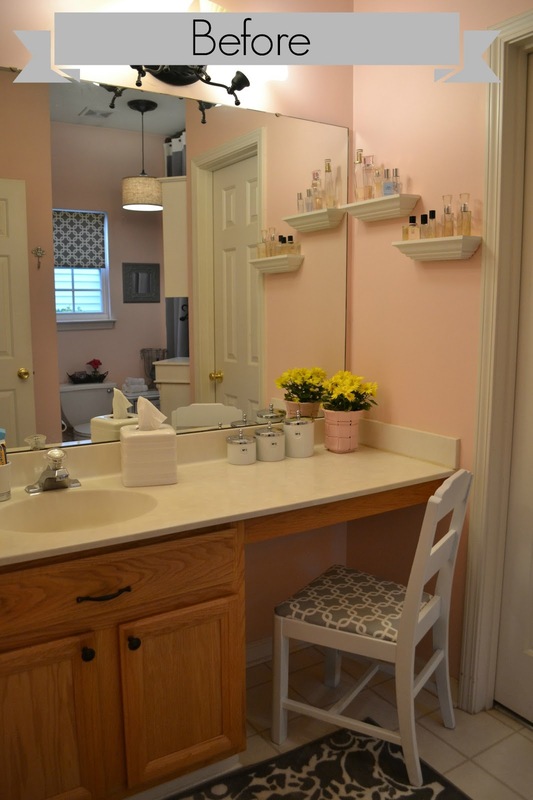 You know I believe that a well-decorated space doesn't have to cost a fortune and clearly Mirror Mate gets it. ...but there are lots of options. Here are a few. Unfortunately, I had a little hiccup with my installation because the frame wouldn't clear my light fixture. After trying to solve the problem myself, I finally had to call in that "buddy" they suggest you have to help me disconnect the fixture. Thanks buddy! Crisis averted and mission accomplished. I'm finally ready to reveal the result. And now with the addition of my Mirror Mate! 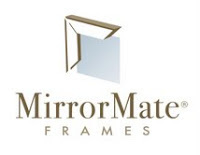 You can read more about the product and see other transformations on their website, www.mirrormate.com. 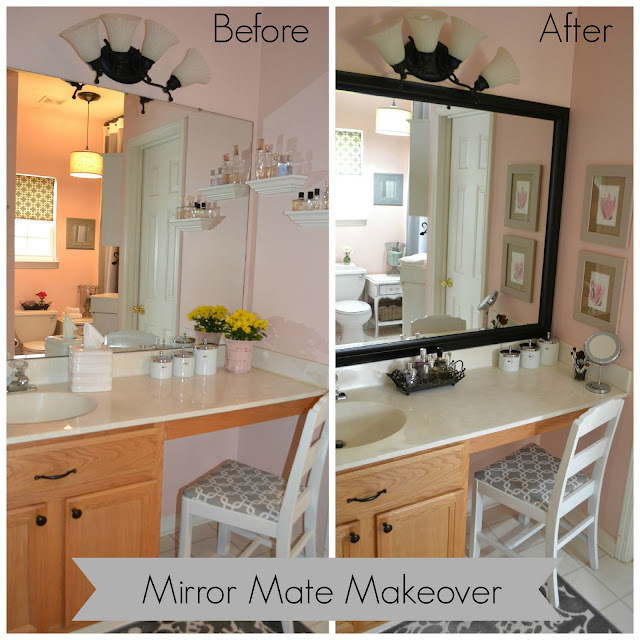 Special thanks to the folks at Mirror Mate for allowing me to try out this fab product. 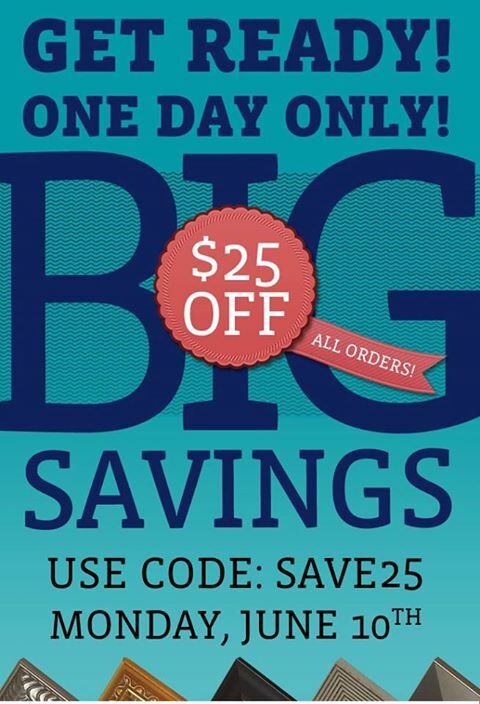 Talk about perfect timing, Mirror Mate is offering $25 off your entire purchase today ONLY. 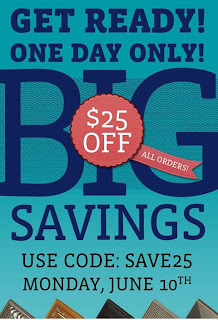 If you're in the market for something to help spruce of your bathroom, you don't want to miss this offer. Now, I wish I could say that this completely finishes my master bath project, but you know it doesn't. Once I had the Mirror Mate installed, I suddenly had the urge to paint the vanity and change the light fixture. 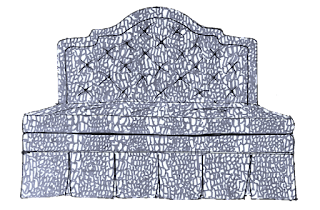 Design is truly never done. I love the end result, and it seems relatively easy to install.